No rows of Clothing and Shoes stores, for that is not what this Culture Street is about. For this we refer to to our Main Menu, and our Reports of Hong Qiao Market, Oriental Plaza (at Chang An Avenue), and the evermore Notorious and Glamorous WanfuJing Street, nowadays Beijing's Main Shopping Hive for the Hip & Flashy modern citizen. After finding Liu Lichangstreet , as mentioned just South of Hepingmen , you may be jumped on by young men & sometimes -women offering "tours" , mainly of their business establishment , or Rickshaw drivers who would like to drive you, eventhough you just arrived. Maybe on the way back ? It's a thought. Welcome to China Report's online guide to Liu Lichang Jie or street , Jewel of the Preservation of Traditional Chinese Culture and a refreshing tourist highlight of the City. Liu Lichangstreet is an interesting place to walk , stroll and enjoy Chinese Culture. A Fun place to shop for your genuine chinese gadgets, english language books and to breathe in Chinese street atmosphere. There are many items to find and/or purchase at Liu Lichang, from Caligraphy Items, Silkware, Tea , Tibetan Folklore art, to Books, Peking Opera Masks, antiques (fake or not) and even then there is more. Let's have a Look. Main Recognition point of Liu Lichang Street, the Crossroads of (Nan = South) Xinhua Jie and Liu Lichang Street. walkway which was removed in November 2004. Heavy construction now ongoing along Nan Xinhua Jie. Get out at Hepingmen Station and Take an exit at The South-side. You are now at the intersection of QianMen Xi(=west) Dajie and Xinhua Jie at a Place dubbed HepingMen for the Former presence of a City Gate. Head down South from here on Xinhua Jie, and you cannot miss Liu Lichangstreet ( see above photos ). Impossible to pass and only some 100 -150 meters. You can ofcourse Take a Taxi too. 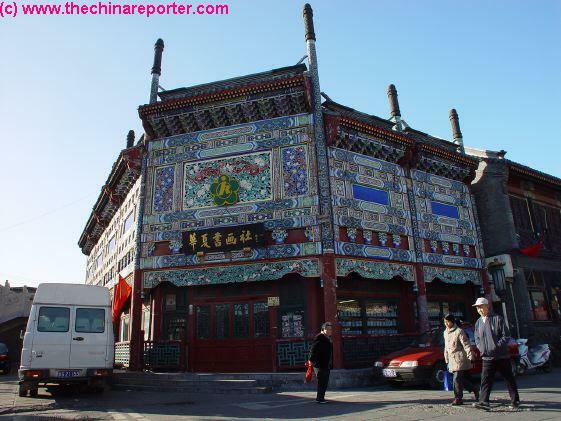 Liu Lichang , meaning "Tile Factory " is a smaller street located in the Oldest Part of the City of Beijing with a Rich History. Owing its Name to the Kiln's that were first used to produce Ceramic (Roof-)Tiles for the Construction of the Imperial Palace (Forbidden City) the area became in important Industrial & Monetary Centre in the early Ming Dynasty. Later Liu Lichang Street in combination with Dashilan Street grew out to be the Centre of a rich commercial District just South of the then City Walls. long gone, still much activity abounds. So, brace yourself for an interesting mix of Traditional products. Interested in Caligraphy and ?? Well ... browse your hearts wish at Liu Lichang West Street , with a multitude of stores providing simple brushes, stone & ink- the basics of every true Caligrapher according to Chinese - to the more sophisticated store selling even books on the subject. You can always find someone happy to give you quality instructions! Other stores include many smaller ones with mostly Fake Antiques, relics from the Ming & Qing Dynasty , or interestingly sculpted kitsch from the Great Cultural Revolution era. Again, choice is plenty and bounty may be rich. For more serious shopping and shoppers Liu Lichang Street also has plenty to Offer. Browse our Impression of Liu Lichang West Street, and find out more about the famed Cathay Bookstore. For decades one of the Best Foreign Language Book providers in Beijing. English-language reading on Beijing and Beijing History, posters, maps & postcards are all available here, as well as in in some Bookstores in the same stretch of Street. Next was Guan Fu Zhai Classic Art Company Antiques Store, once one of Beijing's Best , now closed. Next to to some of the more regular stores selling a variety of arts, there are also some Charming Family run stalls at the Western End of Liu Lichang. According to Internet Gay's there is a homosexual Drag-Queen Bar hidden here somewhere too, but you would have never guessed it when standing there. Never. 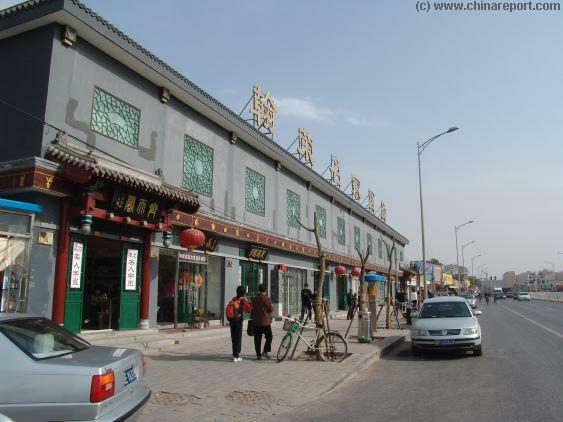 Conclusion - Liu Lichang together with Dashilan Street & Hutong has been and is the foremost jewel of Traditional Chinese Shopping and Preservation in the City of Beijing. Where many vanish with demands of modernity (For instance the early 2005 demise of Silk Street, near Jianguomen) , surely the Oldest & Purest cannot be missed. 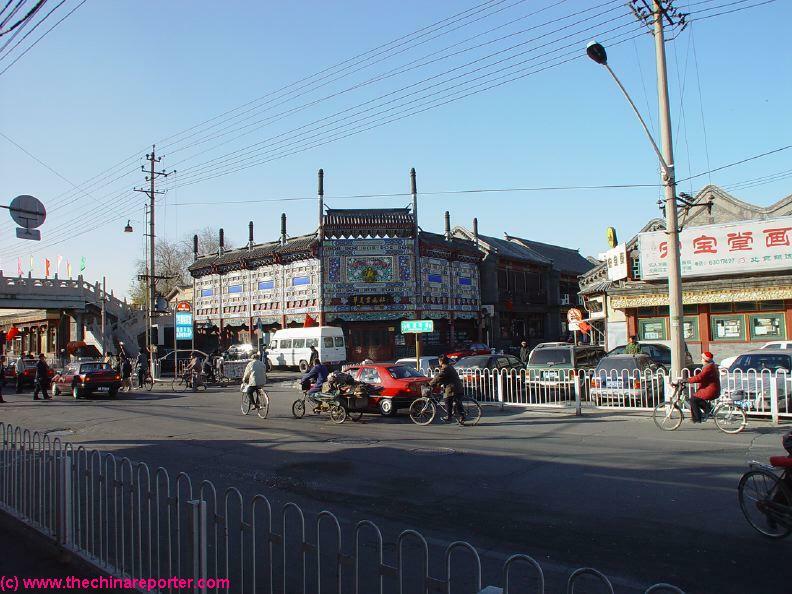 Don't miss Liu Lichang Street and surrounding Hutong on your stay in Beijing. As for its products and scenes - Very worthwhile, especially for 1st Time Visitors, but .. even experienced China Travelers may find their Gem here. Especially in Arts & Crafts or rare English language source Books on Chinese History and Monuments. If you have Time or opportunity to do so, move up from Liu Lichang towards HepingMen ( an area under reconstruction since November 2004) and turn Right & East into QianMen XiHou Heyuan Jie. 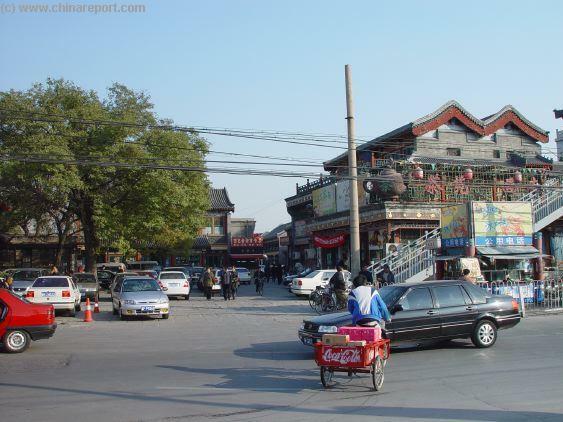 This smalll Hutong Road offers a pleasant walk away from Traffic, passing the Zheng Yici Peking Opera Theatre the oldest wooden theatre in China entire. Browse Liu Lichang East Street and find out more about how to get a pleasant Tea , at Ten Fu (Tea of China), who have their branch, along with a competitor, at Liu Lichang East Street. Other available stores offer mix of various but often interesting Kitsch , fake antique or depending on how you look at it : just Fun Suff ! Start your personal tour on Liu Lichang's small square at the beginning of it's Eastern stretch. Enjoy the book & poster stores, and be introduced to the magical art of making painted little landscapes in a tiny bottle. Ever wanted to watch a Peking Opera Mask being made ?? Experience it Here. There is lots to see and do at Liu Lichang Street. 1) The connecting Pedestrian walkway between East & West Street have been removed from Nan Xinhua Jie crossroads. 2) Heavy construction is ongoing along Nan Xinhua Jie both North of Liu Lichangstreet (Between HepingMen & Liu Lichang) and South of Liu Lichangstreet. Hutong around West Liu Lichangstreet have been levelled and are no more. Hutong at Liu Lichang East continue their vibrant lives. 3) Guan Fu Zhai Classic Art Company has moved from Liu Lichang Street to a New Unknown Address by May 2004. 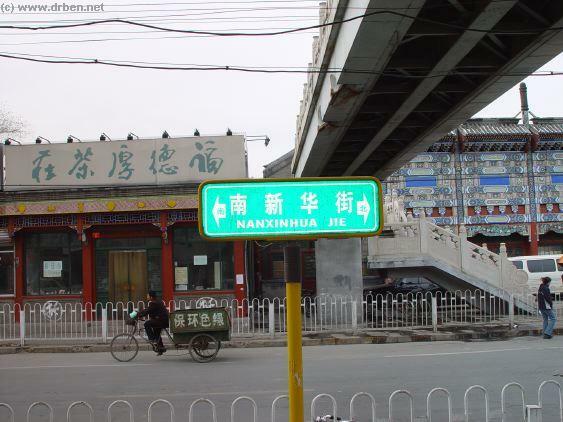 5) In November 2004 a section of Hutong at Western End of Dashilan Street was destroyed and levelled. Since then Dashilan Street has gained some nightlife in the Form of a Bar-Disco. A New Beijing Cinematic History Museum was also opened. 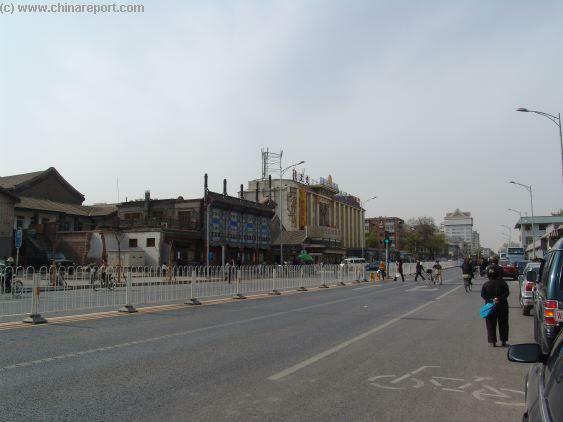 However, in May 2005 the destruction worked its path west taking the Hutong that used to be a charming walking connection between Dashilan and Lui Lichang Streets. In May 2006 half of this Area had been destroyed with the remainder under threat, but leaving a hutong connection in between of Liu Lichang and Dashilan Streets. - Read all about this at : Beijing Planning Exhibition Hall. 6) A Temporary Gallery of the Wanfung Modern Art Gallery Chain has opened at Liu Lichang West Street. Due to ongoing renovations at Wanfung Galleries Main Location in Beijing , the (former) Imperial Libraries East of The Forbidden City this excellent Gallery can now be visited while shopping at Liu Lichang Street ! Worth a Visit ! BEIJING PLANNING EXHIBITION HALL - Read more about the Plan for a Future Beijing and all the changes that are made to the City before the Olympic Games of 2008. The futuristic New City Architecture, the protection of Cultural Heriage sites and the destruction of the Soul of the City, the Beijing Hutong. Located amidst of some of Beijing's most historical "Hutong" - dating back at least to the year 1736 AD , and the Reign of Ching Emperor Chienlung (QianLong) - we find the small Liu Lichang , Beijing's number One Antiques Street, and a Jewel of Traditionally Decorated Storefronts, ancient Beijing Style. Although restored to ancient splendor , Liu Lichang is Pure and breathes the Village Athmosphere of the Hutong , taking you back strolling down memory lane , enjoying some of the old relaxed mode of Living in Beijing. Feel yourself being taken back to more ancient Times. One of Beijing's small Hutong Rickshaws nearly collides with a car at the chaotic intersection of Liu Lichang and Nanxinhua Jie'. Small shops and the pedestrian walkway at NanXinhua Jie'. These are now destroyed. Shrine to The Fire God. A Full Report due early 2005. And 2) The Song Tang Zhai Museum (No.14) , a small place dedicated to the master of Chinese Wood- & Stone-carvings. This small museum can be viewed in exchange for a small voluntary donation. 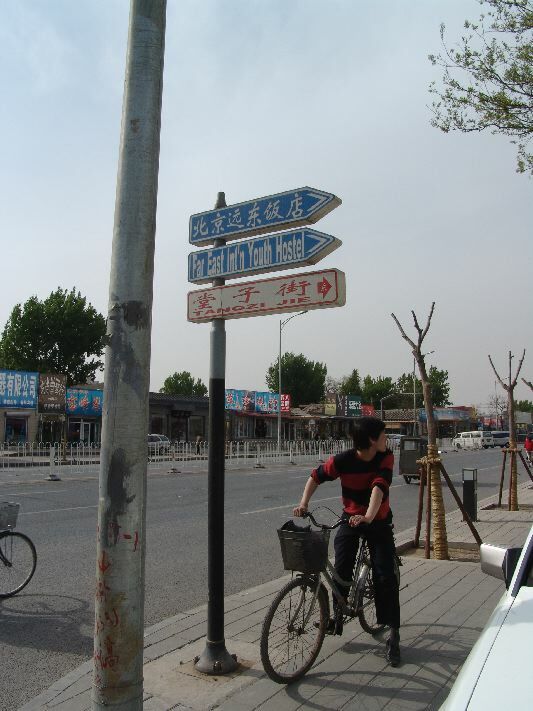 Roadsigns pointing the Way to Far East Youth Hostel in the Hutong. 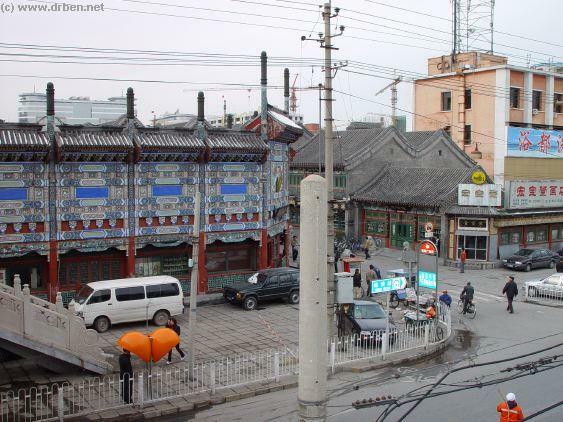 Ancient Hutong structures immediatly adjacent and surrounding Liu Lichang haven been destroyed in 2004/2005. and Li Yuan Peking Opera Theatre. Note : The QianMen Hotel IS NOT located anywhere near QianMen , or Arrow Tower ! To the South-West are more Hutong worthwile exploring. Modernized "Hutong" with cheap immitation Traditional Exteriors that have sprung up since 2006 South of Liu Lichang-street on Nan Xinhua Jie = New China Street.